If I learned one thing from watching Army of Darkness about fifty thousand times before I turned sixteen it is that knights fighting the undead is pretty much one of the best things ever. 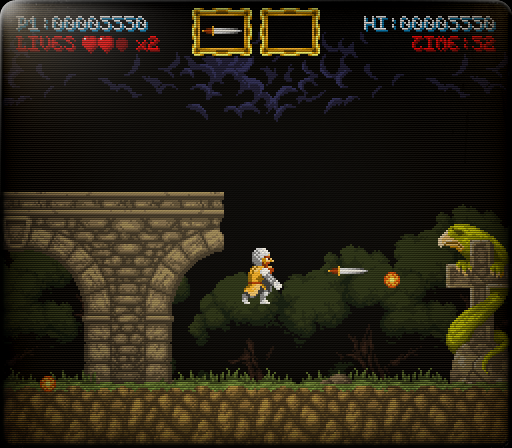 So it's no surprise that I jumped on the opportunity to review the demo of Maldita Castilla, the swashbuckling, zombie slaying latest offering from Spanish code maestro Locomalito. Like his previous games Maldita Castilla does its level best to transport the player to the arcade halls of the 1980s, both with its gameplay and its graphics, and this time around even the screen effects look like a slightly worn out arcade cabinet monitor. But I'm getting ahead of myself, all excited by the cracking job he has done of emulating a beaten up arcade machine in a tatty seaside town! Zooming out to the big picture (and stopping obsessing over how awesome the monitor effect is) Maldita Castilla is a visually rich and mechanically richer linear platformer. With its medieval zombie slaying imagery, 80s arcade graphics and platforming, sword slinging gameplay it really is hard not to at least mention the Ghouls 'N' Ghosts series of games, but despite some visual similarities Maldita Castilla is certainly not a remake of Ghouls 'N' Ghosts, a game so sadistically difficult it used to beat me up at night sometimes and mess with the brakes on my bike. 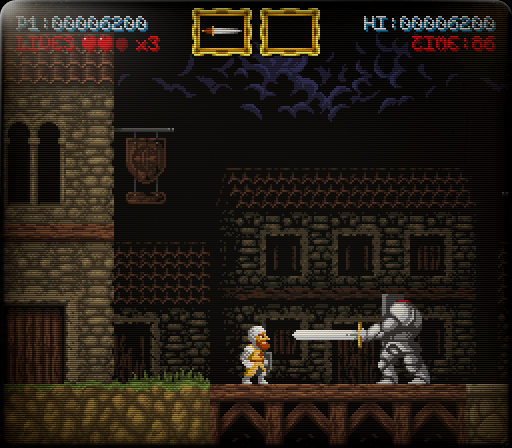 Nope, Maldita Castilla, like Locomalito's other works, is a casual game leaning towards speed runs through visually exciting and technically challenging levels while a counter ticks down and the tension ramps up. Dying is easy, surviving is hard, but it’s not the meat grinder that the G 'N' G series of games was. Gameplay is gripping, and by the time the first acid-spitting, slightly gross boss appeared I was very much on the edge of my seat. Defeating the hordes of monstrous opponents takes skill and timing, not just a fast trigger finger, and Maldita Castilla boasts a great variety of bad guys with which to kill the player in creative ways; about 30 seconds into my first run through the game I got embarrassingly killed by what I thought was foreground scenery! Throughout the game bad guys appear, attack and die in characterful ways: zombies shamble from dark doorways, their legless colleagues drag themselves towards the player, and headless giants turn to stone once defeated. Since this is still just a demo there are going to be a few rough edges. The timer ticks down from 99 to 0 but nothing bad happens at this point, but this is obviously something that's going to be built on in the final version of the game. No doubt a lavishly rendered death awaits the player when the clock rings murder o'clock in the finished version. As with Viriax (the virus-em-up we reviewed back in June) he has teamed up with musician Gryzor87 who has supplied a brilliant soundtrack via an emulated Yamaha YM2203 sound chip for authentic 1980s arcade tones and the atmospheric audio fits perfectly with the moody visuals. With weird enemies that look like children with their hands and heads cut off, snake tailed griffons running all over the place, crumbling, twisted buildings and skulls and dead stuff everywhere the game echoes the dark medieval literature that inspired it; coming on like Splatterhouse meets Breugel. Put simply, Locomalito has done it again, and if this demo is anything to go by the completed game is going to be stonkingly impressive. Download the demo here (from Locomalito's website). Presentation, presentation, presentation... this game's full of it. It's fun. It's easy. It's ghost'n'goblins seen through a nostalgic eye. And it carries a donation tag. Pass? As in it passes the GGN quality test? Or that you'll pass on downloading the full game when it comes out? Colour me confused. Heh, sorry about that James, that's what I get for being vague on the internets (and especially on a language that it's not my native!). Will "I guess I'll pass..." help clear matters?